Vít Jedlička claims to be president of Liberland, a tiny patch of land nestled between Croatia and Serbia. He told RT’s In the Now that his would-be country doesn’t need the huge bureaucracy of the EU. 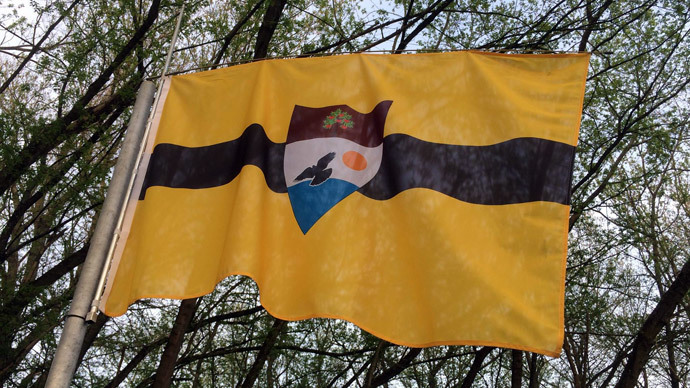 RT:Tell us why does the world need Liberland? Vit Jedicka: We really believe in tax havens because you know more freedom brings more prosperity. And you know prosperity is good for everybody. RT:What made you want less government in your life? VJ: I really believe that government in many parts of the world is stepping on the happiness and prosperity of the people. Where would you like to live: in South Korea or North Korea? You choose. And I think there are many reasons why we should be concerned about our freedoms in Europe. The taxes are always rising. I tried to change that in the Czech Republic and it didn’t help much for five years. We have almost all the time more regulations. There are more than 100,000 pages made by the EU at the moment. So there is a real need to have a really free nation. We can see that there is also a great interest in it. There are over 330,000 people who have applied for citizenship out of which 30,000 are totally serious about this. VJ: It is absolutely legal to claim terra nullius [territory not annexed by any nation] under international law. And there are studies by universities which go deeply into the issue, and clarify that this was and now is Liberland what used to be terra nullius there. And I tried to go, to reach Liberland or to reach the cops that were operating in Liberland from both sides. And it is very funny. When we went from one side, we were arrested for trespassing from Croatia to Serbia despite the fact that we had papers from the Serbian government which says this is not Serbia's territory. And when we tried to enter from Serbia's side we were fined for crossing Serbia's territory, which is quite funny. I'm wondering what the court at the next level is going to do about this? RT:You've said that Europe will be better off without the EU. Why? VJ: I'm a big fan of the European free trade agreement. And I'm actually going to visit the officials of EFTA pretty soon on my way to Switzerland. There is going to be a vote on the recognition of Liberland in the near future. So I'm a big fan of this organization because it basically brings all that is needed regarding European integration. We just need to have the possibility to trade freely across nations. We don't need this huge bureaucratic body. RT:Let’s talk more about tax havens. You say we need more of them around the world. Isn't Liberland going to become a place for the world's richest to avoid paying their governments? What kind of people want to join your country? VJ: Rich people already don't pay any taxes and they have the means how to get rid of them. The problem today is that the rich people are actually taking money from the governments. Just consider the Czech Republic. The finance minister was able to get money from EU subsidies to build his own ranch, his own private mansion. And it was 50 million Czech Crowns, which is a lot of money. So the problem of today is completely the opposite. The rich people are taking money from the poor people through all these donations, subsidies, these projects that are made by the EU and also at national levels. RT:I just want to clarify how many people in fact signed up for citizenship? VJ: Well, we've got 330,000 people who are registered for the citizenship. Some 34,000 fulfill all the criteria that we expect from a good citizen. RT:And what are your plans for the country? Well first we need to make sure that we make a deal with Croatia. And I have been working with the diplomats here. I've been talking to foreign ministry people, with the deputy chairman of the Foreign Ministry and he told me that our project has a chance to succeed if we are mainly about peace, love and freedom. And I think actually that is exactly what we are about.